This is an application to indicate the radiation amount in the air at the current location and all over the nation. Data from official data and contributed user data will be shown for the air radiation amount. 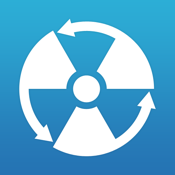 People who have radioactive detector and/or dosimeter can contribute the measurements via this application. The most updated data released in “National Radiation Monitoring Data” from Ministry of Education, Culture, Sports, Science and Technology will be shown. Consist with contributed figure from people who has radioactive detector or dosimeters and official data. • Reliability and precision of data on the application will be subject to the source of the information. We are making our best effort to reflect the most updated data. However, there may be an occasion to cause delay due to the situation of official data release and/or numbers of user contribution. We would like to express our heartfelt sympathy for disaster victims of East Japan Great Earthquake.